Watkinsville City Hall is located at 191 VFW Drive, Watkinsville, GA 30677; phone: 706-769-5161. 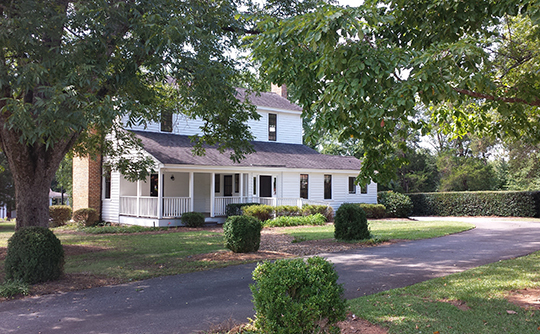 Photo: William Daniell House, circa 1814, Epps Bridge Road, Watkinsville, GA. Listed on the National Register of Historic Places in 1995. Photographed by user:Cathy Allison (own work), 2014, [cc-by-3.0 (creativecommons.org/licenses/by/3.0)], via Wikimedia Commons, accessed March, 2018. The earliest record of the land on which the City of Watkinsville now stands is found in the records of Clarke County in 1791. In 1806, the City of Watkinsville was incorporated as the County seat of Clarke County. Bogart, on the county's northern border, was founded in 1869 and was originally named for Osceola, a Creek-Seminole Indian. The town was renamed Bogart for a railroad agent in 1892. Bishop, originally known as Greenwood Crossing, was named for local resident W. H. Bishop (one of the city's original council members). Bishop was incorporated in 1890. North High Shoals, on the southwestern border, was named for a rapid in the nearby Apalachee River. It was incorporated in 1933. The construction of the Eagle Tavern in 1789 as a blockhouse for the protection of settlers against Indian raids marked the establishment of what is today the City of Watkinsville.